Carrier yesterday announced the grand opening of its new office and newly expanded product offering in Sri Lanka. Leveraging global expertise and an extensive portfolio, this newly-formed entity willincrease the accessibility of Carrier staff and servicesand theavailability of its end-to-end air-conditioning solutions, enablingshorter lead times and better customer service. Carrier Aircon Lanka Ltd. is a fully-owned subsidiary of United Technologies International Corporation Asia PteLtd. Carrier, a world leader in high-technology heating, air-conditioning and refrigeration solutions, is a part of UTC Climate, Controls & Security, a unit of United Technologies Corp. In Sri Lanka, Carrier will offer air-conditioning products from two brands–Carrier and Toshiba - which operate through a joint venture.Carrier, the inventor of modern air-conditioning, will bring world-class products, and Toshiba, the inventor of inverter air-conditioning technology, will offer top-of-the-line, high-quality products with Japanese technology. The products and service offerings are differentiated based oncustomer segments andneedswith a complete range available for residential, light commercial and commercial applications. Bothbrands will cater to all customer segments including commercial buildings, hotels, hospitals, residential projects, small offices, banks andretail shops. 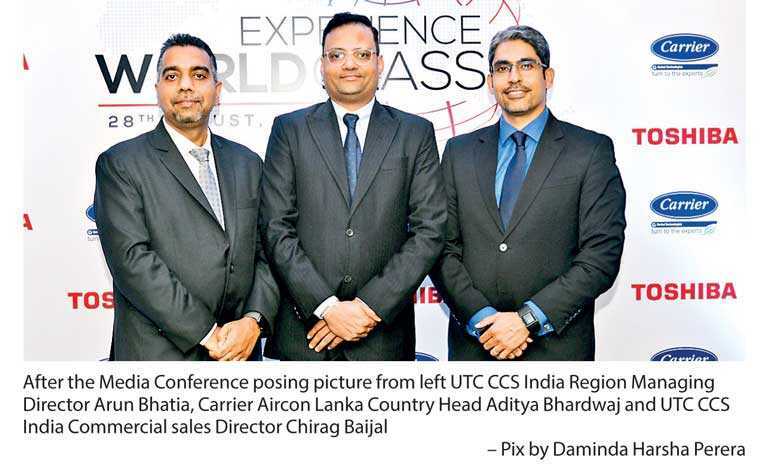 “We will offer top-of-the-line, superior quality products from Carrier and Toshiba in Sri Lanka,” said IndiaControls and SecurityUTC Climate Marketing DirectorFarokhMadan. At Carrier, sustainability is a high priority andisincorporated into many of the products and services that will be available in Sri Lanka. Whether it’s reducing greenhouse gas impact, leading the phase-out of ozone-depleting refrigerants or introducing many of the world’s most energy-efficient building solutions, Carrier has led and been a part of green building movements across the globe. In fact, Carrier is the founding member of green building councils in countries across the world including the US, China, France, Argentina, India and Singapore, among others. On energy efficiency, Carrier takes a holistic view, looking at building-level energy efficiency rather than just for its equipment itself. It also assists customers with existing buildings with old HVAC equipmentbyconducting detailed audits and suggesting interventions that can reduce energy consumption substantially. The new Carrier office is locatedat the West Tower of the World Trade Center in Colombo, Sri Lanka.